The 5th Legal Forum Asia, held on 16 May 2018 at the Marina Bay Sands in Singapore, was a truly inspiring conference. We spoke to so many interesting, motivated and passionate people about their role in the future of law. This annual networking event hosted by leading Australian conference group Chilli IQ brings together an impressive group of legal services sector providers from across Asia to learn about and debate crucial topics affecting the legal industry. You will gain insights from and exchange ideas with an impressive group of legal and commercial professionals from a wide range of backgrounds including international and independent law firms; in-house counsel; legaltech & software solutions providers as well as risk and compliance professionals. Also attending the 5th Legal Forum Asia was Lesley Hobbs, CEO of Cognatio Law. Lesley spoke to Stephen Lai of leading online legal media group Conventus Law on the subject of the rapid rise of NewLaw in Asia, and the role NewLaw will play in the future of the legal industry. In the below video (Conventus Law production), Lesley Hobbs highlights the feature characteristic of all legal services firms; whether NewLaw, OldLaw, or BigLaw; which is that the key to survival is being able to innovate and adapt. Lesley goes on to speak about how NewLaw firms must ensure that they have the technology, relevant experts and legal professionals prepared and available to go on assignment, in order to compete with BigLaw firms which generally have the bigger platforms, more sizeable resources and human capital capabilities. Where NewLaw firms stand out is with their ability to be nimble within tight deadline situations. Watch the short video above, from the 5th Legal Forum Asia, for full details. 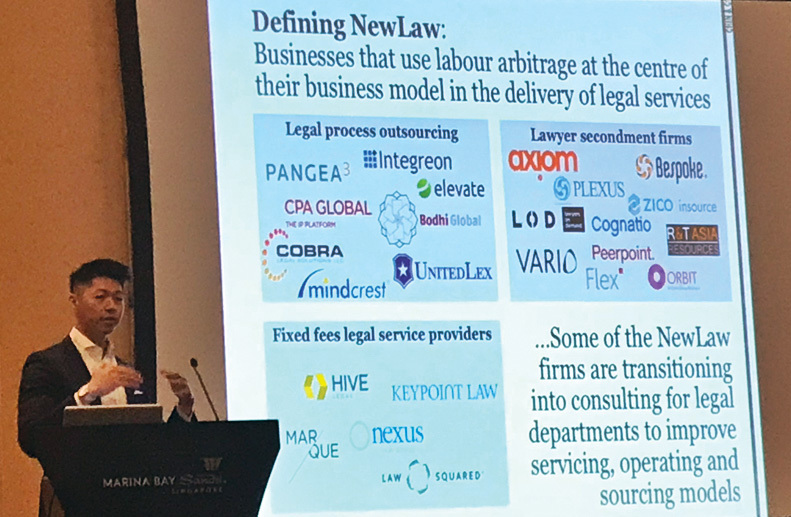 Eric Chin, who coined the term ‘NewLaw’, spoke on the state of the APAC legal industry at the 5th Legal Forum Asia in Singapore. Cognatio Law was very pleased to have been included in his core presentation under “Lawyer Secondment Firms”. Cognatio Law was established in 2018 by NewLaw industry veteran Lesley Hobbs, with co-founder Tim Fawcett, in response to the growing demand for flexible lawyers in Hong Kong. Lesley Hobbs is a leading business development professional and was instrumental in setting up Hong Kong’s 2nd largest NewLaw firm in May 2013. If you are in need of additional legal and compliance resources in Hong Kong, please contact us today to engage our professional consultancy services.